Coming up is a tremendous interview with Michael Rivero of WhatReallyHappened.com. Michael tells us what to expect during the rest of the primary season, whether or not Donald Trump can be stopped, and how likely we are to see inflation come roaring back. Don’t miss another incredibly informative interview with a man who pulls no punches, Michael Rivero, coming up after this week’s market update. Equity, commodity, and precious metals markets all got a lift this week from the Fed. The Federal Open Market Committee kept its benchmark Federal Funds rate unchanged on Wednesday, as expected. Fed officials suggested they still want to raise rates this year, but they are now projecting just two rate hikes instead of four. Whether they will actually raise rates at all is yet to be seen. But we kinda doubt it. Fed chair Janet Yellen admitted that weak economic conditions outside the U.S. and ultra-accommodative monetary policies being pursued abroad dissuaded the Fed from tightening. It will be difficult for U.S. monetary planners to raise rates as long as rates in Europe and elsewhere remain negative. In any event, investors reacted positively to the Fed’s announcement even though, when you really get down to it, there isn’t much good news out there. The Dow Jones Industrials rallied on Thursday back to break even for the year as the U.S. Dollar Index fell to fresh new lows for the year. The dollar decline helped boost precious metals markets, with the white metals outperforming gold. Gold prices fell early in the week but rebounded on Wednesday. As of this Friday morning recording, gold shows a small weekly gain of 0.2% to trade at $1,253 an ounce. Gold outperformed silver the first two months of the year as the gold to silver ratio hit multi-year highs. But so far this month, silver is trading stronger than gold. Although it has run into some resistance at the $16 level the last couple of days now, silver is still up 2.3% this week, with prices currently coming in at $15.89. Turning to the platinum group metals, platinum moved higher by 0.9% this week to trade $975 an ounce. Palladium prices come in at $589 and are now registering a 2.1% weekly gain. The advance in precious metals is being confirmed by rallying copper and crude oil prices. It’s been a huge week in the oil market, with prices surging above $40 a barrel. Investors aren’t complaining, because higher commodity prices suggest that the threat of a deflationary episode is abating. We’re starting to see some inflation indicators perk back up, albeit very modestly for now. Official inflation rates have fallen below the Federal Reserve’s 2% target much of the time over the past few years. At her press conference this week, Janet Yellen acknowledged the potential for inflation to at some point begin “overshooting” the Fed’s target. Janet Yellen: Our inflation objective is 2% and we're projecting a move back to 2%. And we are not trying to engineer an overshoot of inflation, umm, not to compensate for past umm, past undershoots. Some undershoots and overshoots umm, are, umm, part of how the economy operates and, umm, our tolerance for those is symmetric with respect to under and overshoots. We want inflation to go back to 2%, umm, but we also want to be careful not to see some significant overshoots, with respect to, uh, under and overshoots. erreach through bailouts, bond buying campaigns, and zero or negative interest rate policies, they create massive distortions. It would also be nice to hear the Fed chair admit that central bankers don’t always know what the heck they’re doing with all the newfangled powers they’ve assumed. Scott Minerd: Central bankers are notorious essentially for getting it wrong. I think it's because – being exposed to them a lot – they get into a group-think academic kind of world. Bill Gross: The Fed along with other banks with central banks has been engaged in a series of monetary policies since 2009 that have produced substandard economic growth and created financial asset bubbles of, I think significant proportions with negative interest rates that you mentioned, and 40% of major sovereign bond markets. I think capitalism in a finance-based economy cannot function well when savers pay banks to hold their money. That was Scott Minerd, CIO of Guggenheim Partners followed by Janus Capital’s Bill Gross, the world’s leading bond fund manager. Gross is finding it difficult to generate yield in this environment without taking undue risk. Junk bonds took a severe pounding late last year, but Treasury bonds have held up fairly steady. That could change if investors begin to perceive that their yields are too low to compensate for the risk of rising inflation. If inflation overshoots to 4% or 5% or higher, then a Treasury security yielding 2% won’t seem so risk-free anymore. Mike Gleason: It is my privilege now to welcome in Michael Rivero, founder and editor of WhatReallyHappened.com. Michael is a talk radio host and a prolific commentator on geopolitics, financial markets, and many other topics, and it's great to have him back with us today. Michael, thanks again for joining us. Michael Rivero: Thank you for having me. Mike Gleason: Well, Michael this is the first time we've had you on since December, and an awful lot has happened, most notably on the political front now that we're deep into the presidential primary season. And boy, this sure is shaping up to be a wild year, and the big story has been the inability of the Republican establishment to bring forth a candidate the GOP voters want to get behind. Now earlier this week, Marco Rubio dropped out of the race, and now we're down to just two contenders, one conservative who fought the political establishment since being elected by Texans to the U.S. Senate, and one establishment guy who serves as Ohio's governor, and those are the only two left to challenge the front runner, Donald Trump. So before we get into the financial and economic ramifications of all this, is Trump unstoppable? Michael Rivero: Unfortunately, sadly Trump is very stoppable at this point. He is not going to be able to get enough delegates to secure a first ballot victory. And we're already hearing talk from inside the GOP party leadership that they're simply going to change the rules around to allow the GOP party leadership to pick the candidate they want, and we have some of these GOP leaders like Curly Haugland who are out there point blank telling the Republican voters it's not up to you anymore. "We will pick the candidate and all you're good for is money and votes, and it's none of your business who the candidate is going to be." They've been trying to use the Ron Paul method to get Donald Trump out. That isn't working. Push comes to shove, if Trump does succeed in getting enough delegates and support, they may even try to assassinate him. But at this point it looks like there's going be a brokered convention, and the GOP leadership is going to throw out all the existing rules. There's talk that they're going to try and install Jeb Bush as the candidate. They were floating the idea of Mitt Romney. John Boehner was suggesting Paul Ryan, but Paul Ryan has already said he's not really interested in doing that. The upshot of this is that if the GOP leadership does not get behind Donald Trump, they're for all intents and purposes handing the White House to Hillary Clinton, because the division within the GOP party is at the point where rank and file Republicans are saying if they don't get Donald Trump, they are not going to support whoever the GOP party leadership puts on out there. And of course, this plays to Hillary's advantage. Now, you need to remember early in her career, Hillary Clinton worked on and was fired from the Watergate committee investigating Richard Nixon's skullduggery during his re-election campaign, so she has had a close education on election dirty tricks and she's using every one of them, and she's basically replaying Richard Nixon's re-election strategy. She's trying to sabotage any GOP candidate who might stand a chance against her, and engineer that she's going to run against some GOP hack that she can just steamroll over. Mike Gleason: We're hearing about massive protests against Trump now that it appears he's maybe the voters' choice. Clearly he's an outspoken guy and many don't agree with what he has to say, but why do you think the public outcry is both so broad and intense? It's coming from the political left, other nations, and obviously from the Republican establishment itself. Why is that happening? 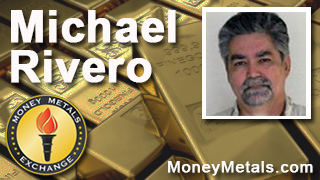 Michael Rivero: Well Donald Trump has his own money. He can't be bought. He's not taking donations from large corporations and vested interests. He is an anti-establishment candidate, and that is his strength and his threat. The agenda going into the November general election was to have two presidential candidates who were both in favor of pursuing the war agenda, and then you have Donald Trump standing up saying, wouldn't it be nice to go back to being friends with Russia and China, and just do business with them and do deals and piece new commerce. And that is a serious threat to the current status quo inside the United States. His promise to be neutral on the issue of Israel and Palestine has scared the Israeli government. They want a president that they absolutely know will do what they're told to do, and Donald Trump is not that man. There's an even more fundamental issue out there, and that is that Donald Trump is not a career politician, and that's very attractive. He comes out of the world of business where if you don't keep your word, you are out of business. And that's in stark contrast to professional politicians who lie about everything from the moment they get up to the moment they go to bed, and that's just accepted behavior. So while you may not agree with everything Donald Trump says, and I don't, you know it's what he really feels and what he's really going to act on. He's not out there saying one day that he's going to shut down all the coal producers in the country to placate the global warming crowd, and then 24 hours later telling coal miners, well yes, there's a place in the future for you, which is what Hillary did last week. So people understand that Trump, what they see is what they're going to get with Donald Trump, and mostly it's an anti-establishment vote. Trump is a reactionary president. If the U.S. government were doing the proper job for the American people and the American nation, and they weren't plundering us all to pay for wars of conquest and prop up Wall Street and Israel, Donald Trump's campaign would be a joke because of his brashness and his character. But the people are responding to him because they get this sense the man is very real. They're going to Donald Trump because he's not Jeb Bush and he's not Ted Cruz and he's not Hillary Clinton, and that's why the establishment is terrified of him. If Trump were to win the White House, it could signal the end of the neo-con agenda. It could signal the end of taxpayer-funded propping up of Wall Street. Donald Trump has been through ups and downs in business. He understands that's the way it's supposed to work. A Donald Trump presidency would stand back and say, all right. Wall Street banks wrecked themselves. Let them collapse and make way for new banks that are going to have better fiscal sense, and for the entrenched money powers, that is definitely a problem. Now a big opponent to Donald Trump, of course, is George Soros, who's pouring millions of his dollars into trying to defeat Trump. In fact, George Soros is funding MoveOn.org, and MoveOn.org is openly bragging that they are the ones organizing and orchestrating these anti-Trump protests in places like Chicago. And Chicago's mayor, Rahm Emanuel, who used to work in the Clinton White House, literally ordered a reduction of police at that Trump rally so that the protest could get out of control to make Trump, and also to make Bernie Sanders look bad, because the protesters were told to chant "Bernie, Bernie, Bernie" to get Trump and Bernie into a mudslinging contest, which is again going to benefit Hillary Clinton. So George Soros is a big promoter of this idea of a one-world government, of dropping all borders. His nongovernmental organizations have been behind luring refugees into Europe and coercing politicians to drop the borders. He's a big supporter of amnesty for illegal immigrants and refugees here in the United States of America, which our economy really cannot survive at this particular point. And Donald Trump is not going along with this New World Order, one planet, one massless, faceless lump of humanity to be workers and support the oligarchs. So Soros is dead set against letting Trump become president because Trump is going to reinforce our borders and he's going to work on the American nation, making the United States function and let the rest of the world take care of itself, and Soros is very much opposed to Donald Trump at this point. Mike Gleason: Switching gears now, certainly the markets have been quite volatile this year. We saw stocks start out very poorly, perhaps as a response to the uncertainty in the election. Then as it became less likely that the Fed would raise rates, we got a rally, and then this week, we had the Fed coming out and saying they project only two interest rate increases this year instead of four, which gave the markets another boost. Through it all, gold has been the best performing asset and has done well both during the first month or so when stocks were selling off, getting a safe haven bid, but gold and silver are looking good now also as stocks have rebounded. So what do you make of the market action so far this year, Michael? Michael Rivero: Well unfortunately we're seeing a lot of manipulation and rigging in the paper markets, and governments are looking the other way because they're trying to make everything look good, especially here in the United States during an election year. We're just finding out now that the investigation into that five trillion dollar a day Forex rigging scandal in Britain has now been dropped. They admit they found evidence of criminality, but they're saying, well “we're not likely going to have a successful prosecution, so we're just going to let them get away with it.” And it’s reached the point where the rigging is so intense that the normal technical analysis by which investors would predict what the market is going to do is breaking down. And as a result, a lot of small independent investors are already getting out of the stock market, and much of what you're seeing is basically churning between the Wall Street banks and the large corporations flipping blocks of stock back and forth, trying to keep those number high. Because if there is a correction, there's a couple of things that are going to happen. First of all, because gold and silver are looking so attractive right now, people are thinking seriously about closing those negative interest rate savings accounts and getting into metals, and the paper equities market and the government are trying to figure out some way to stop that, which is why they're talking now about a cashless society. If there's a correction, people are going to dump their stocks, again going back into metals as a reliable store of value. And more importantly, all of these financial institutions that have been part of this plunge protection team since the Bill Clinton administration, they're holding huge blocks of heavily overvalued stocks on their books right now, so they're kind of stuck. They have to do whatever they think it's going to take to keep those stock market numbers up, because if there is a correction, many of those corporations are going to be instantly insolvent overnight, and it's going to make 2008 look like a minor speed bump in comparison. So all of these little emergency measures and bailouts and bail-ins and TARP and rigging which were supposed to be temporary emergency measures, they've now become absolute necessities. Wall Street is now addicted to this pattern of fraudulently rigging the numbers. One of the most obvious examples, of course, is the continued claim that we only have a 5 or 6% unemployment number when we have ninety three million Americans in this country willing and able to work who have not been able to find jobs for years. And the books are cooked by taking those long-term unemployed and putting them into a separate category, and the unemployment numbers are only those people who've lost jobs in the last few weeks, and that's how they make the numbers look good. Again, this is an election year and the incumbents are trying to protect their positions in power, and lying to the public gets them what they want up until the public wakes up and says we know we're being lied to, and we're just not going to listen to you any longer. Again, silver and gold are looking good. There has been rigging trying to keep those numbers down in order to keep people in their savings accounts and the equities markets. But there's going to come a point where that rigging simply is not going to be able to work any longer, and people are going to buy into gold because the price is being held down, not because they expect the price to go up, but because they know the price is not going to go down anywhere near as much as the paper markets when there is a correction. Mike Gleason: Certainly things would be a whole lot different there if we focused on the labor participation rate instead of the phony unemployment rate like you said. The Fed is between a rock and a hard place, and they've done nothing but backpedal since the tiny rate hike they did in December. What impact do you see all of this having on inflation because obviously they want more of it. Do you think we're going to get it? Michael Rivero: I think it's going to be inevitable. Basically the response by the Federal Reserve and the government to any new economic crisis is create a whole new bunch of money and paper over the problem, and at some point that inflationary pressure is going to start having an effect on ordinary Americans. It already is to an extent. Food prices are certainly up. Oil prices and gas prices would be up if it hadn't been for that ill-considered oil price war against the Russian economy. So it's hard for a lot of people to see that inflationary pressures are starting to manifest themselves in the real world, as it were. But all anybody needs to do is walk down the main street of their town or city, looking at it as if they were a tourist from another place, looking at the cracks in the pavement, the rust and corrosion, the huge number of retail vacancies that are showing up, to understand that this nation's economy is still in serious trouble. That's what happened with Iraq. In 2002, Iraq got United Nations permission to sell Iraq's oil for the euro instead of the dollar. One year later, screaming nuclear weapons of mass destruction, which never existed, the U.S. invaded Iraq, killed Saddam Hussein, and put Iraq's oil back on the world market, but only for the U.S. dollar. The same thing happened in Libya, where Gaddafi threw out their private central bank, he established a state central bank and a value based currency, the gold dinar, and then he announced that Libya's oil was only going to be for sale for the gold dinar. So the U.S. goes on it there, kicks up what they called a revolution, kills Gaddafi, puts Libya's oil back on the world market, but only for the U.S. dollar, shuts down the state bank, imposes a private central bank, and the gold for the gold dinar has now vanished. Mike Gleason: We've talked about the war on cash with you in prior interviews, and you alluded to it a little bit earlier. And it does seem to be picking up some steam both here in the U.S. and in Europe with the talk of eliminating some of the larger bills in circulation. What's the latest news on the war on cash, Michael? Michael Rivero: Well they're trying to start with the larger bills under the excuse that this is going to somehow limit crime and terrorism and drug dealing, which it absolutely will not, but the end goal is for all of our money to be under their control in their banks where they can dip into it whenever they want, whenever they hit a cash shortage. And this, of course, is the ultimate goal of all private central banking, is all the money and all the real wealth in the hands of the bankers and all the debt is dropped onto the people to make us their slaves. It's literally a revival of the feudalist system from the Middle Ages. And at this point when they ban cash, I would expect that they're going to ban private ownership of precious metals at the same time. In fact, they will try and ban any portable store of value that they cannot have direct control over. And there is obviously among ordinary people a tremendous resistance to this idea. When somebody goes to work and they get paid, they want to put their cash in their pocket, which gives them the freedom to do whatever they want with it. When you have a cash-free society and you run that little plastic card, the bank may contact your health insurance company which says “no, no, you're not allowed to buy a sugar doughnut on the way home from work because you're borderline diabetic.” I mean, that's how draconian and totalitarian the control is going to be in a cashless society. Mike Gleason: Gold has outperformed silver this year, which is unusual when the metals are rising because usually the whites lead the yellow, as our friend, David Morgan, the Silver Guru, told us last week in our interview with him. So do you think silver might play some catch-up? Michael Rivero: It's hard to say. A lot of it has to do with the industrial uses of silver, and I know silver took a hit during the transition from chemical-based photography to digital photography, but it is catching up again. It's hard to say which is going to outperform the other. Frankly, anybody who's investing in metals ought to play the diversification role and have some of every little bit, silver, gold, platinum, maybe even a little copper, and I know copper is still looked down on as a lesser metal, but then when I was a kid, copper is what we made the plumbing out of. That was what you bought at the hardware store. Now it's being put out in bars and rounds for investment, and in enough volume, it could be a player as well. Mike Gleason: As we begin to close here, Michael, any closing thoughts about the economy or the markets or the election? Michael Rivero: Well at this point, our entire economy is in serious, serious trouble, and because of globalism, the entire global private central banking network is in serious trouble, and that's why they're hitting the panic button on so many fronts. Some years ago, I wrote an article called, "The Eleventh Marble," which was an illustration of the basic fundamental flaw of private central banks which issue the public currency as a loan at interest, and that is, of course, that this system creates more debt than money with which to pay the debt until the debt swells to a point that it collapses the system. And that's pretty much where we are right now. There was apparently this Wall Street economist who wrote a long article about why I was wrong on "The Eleventh Marble," but I think history has sort of vindicated that position. The entire system has to come down eventually. No private central bank-based system has ever perpetuated because they're not designed to be stable over time. They're designed to grab all the real wealth of a nation and put it in the pockets of the bankers, and saddle the people with debt in order to reduce them to a condition of slavery. It's a system of governance. It's a system of enslavement. It's ruled by bank debt, and it's no more legitimate a form of governance than rule by divine right or rule by slavery, and like those previous failed systems, it only works as long as people allow themselves to be brainwashed into believing this is the way the world is supposed to be. When we all become private central bank heretics and say “we're just not going to listen to this religion of private central banking that you've created,” the system is going to come crashing down, and then we can go back to an economic model that works for the nation and its people, which is, of course, the economic system the United States was founded on. Unfortunately, politicians are corruptible, and three times in our history politicians have sold us back into that same predatory banking model that we fought the Revolution to be free of. The First and Second Banks of the United States, and now, of course, the third bank of the United States, otherwise known as the Federal Reserve. Mike Gleason: Yeah, it'll be interesting to see if we can actually see some real change without some sort of crisis event taking place. I have my doubts on that personally. I think we are headed towards that, as you do as well. Well, Michael, I really want to thank you for your wonderful insights. We live in fascinating times, and I look forward to catching up with you again real soon. Now for people who want to both hear and read more about what you have to say on all of this and many other important subjects, tell them how they can do that. Michael Rivero: I run a website called WhatReallyHappened.com, and we just celebrated our 22nd birthday on the website, and I do a daily talk show on the Genesis Communication Network Monday through Friday from 3 p.m. to 6 p.m. Central United States Time. Mike Gleason: Well it's truly great stuff. Thanks again, Michael. I always thoroughly enjoy it, and I hope you have a great weekend. We appreciate the time. Michael Rivero: All right, thank you. I look forward to doing it again. Mike Gleason: Well that will do it for this week. Thanks again to Michael Rivero, founder and editor of WhatReallyHappened.com. Check back next Friday for the next Weekly Market Wrap Podcast. Until then, this has been Mike Gleason with Money Metals Exchange. Thanks for listening, and have a great weekend everybody.